Read these frequently asked questions about starting an Sigma chapter or joining an at-large chapter. Q: Can a chapter or at-Large chapter be established in a state, region, or country, or must it be formed at an institution of higher education? A: According to Sigma Bylaws Article IV, Section 2.a: “A chapter may be established in an educational unit which is an integral part of an institution of higher education and that grants a baccalaureate or equivalent degree, which leads to the first professional nursing degree.” However, schools and/or institutions of higher education from various states, regions or countries can collaborate to form one at-large chapter. As of February 2016, practice settings may partner with a school of nursing to form a brand new at-Large chapter or collaborate to join an established Sigma chapter. Q: The highest degree granted at my school of nursing is an associate’s degree. Can we still have a chapter? A: No. According to the bylaws, only universities and institutions of higher education that grant a minimum of a baccalaureate degree or the equivalent are eligible to establish a chapter or at large chapter, or to join an existing chapter or at-Large chapter. Q: How do I know if the institution of higher education where I want to start a chapter or at-Large chapter is properly accredited? A: According to Sigma Bylaws Article IV, Section 2.a: “The baccalaureate or equivalent degree nursing program within the institution of higher education shall be accredited by a recognized accrediting body. In the event there is no nursing accreditation system in place in the potential chapter’s country, the program shall provide evidence of its quality.” Please note that it is the actual degree program, not the overall institution, that must be accredited. In the United States, recognized accrediting bodies are the Accreditation Commission for Education in Nursing (ACEN), Commission on Collegiate Nursing Education (CCNE), Council on Accreditation of Nursing Anesthesia Programs (COA), and Accreditation Commission for Midwifery Education (ACME). For other countries, the accrediting agency may be the Ministry of Health or Education or a national or provincial nursing council. Q: According to the guidelines, we need to have functioned for one year before applying to become a chapter or at-Large chapter. How do we determine what is one year? A: One year is marked from the day of your first induction ceremony. Also note that honor societies need to have accumulated more than 50 active members, a year's worth operating expenses, and collected renewal fees at least once prior to applying for chapter charter. Q: May our inductees purchase and wear Sigma honor cords? A: The privilege of wearing an honor cord is a benefit of Sigma membership and is a symbol of that recognition. Therefore, honor society inductees are not allowed to purchase or wear Sigma honor cords until the official chapter charter ceremony or after. Q: Are we required to send representatives to the biennial convention? A: All chapters and at-Large chapters are required to have representation at the House of Delegates during each biennial convention. Honor societies that are still in the development stages are welcomed and encouraged to attend, but are not required to attend. Q: There is so much to do! Where do I start? A: A good place to start is to determine whether or not there is interest and support at your institution of higher education for a chapter or at-Large chapter. If adequate support is found both from university officials and potential members, please contact Sigma chapter development staff for guidance in determining next steps. More information can be found on start a chapter webpage. Q: How much do we charge for honor society membership? A: Your honor society induction/membership fee is determined by your board of directors. The amount of the fees should provide the honor society with enough income to pay for its expenses for a minimum of one year. Q: What is the difference between an induction fee and a renewal fee? A: An induction fee is the amount that is charged when a candidate becomes a member of your honor society and is inducted. A renewal fee is the amount of dues that is charged annually for a member to remain active with your honor society. Q: Do we have to charge different amounts for the induction fee and the renewal fee? A: No, the amounts can be the same if the honor society wants. The amount(s) to be charged is decided by the developing honor society board of directors and will be based on budgetary need and the honor society's strategic plan. Q: Do we pay any money to Sigma before we apply to become a chapter or at-Large chapter? A: No. You owe no money to Sigma until the actual chartering ceremony. At that time, the chapter or at-large chapter will be expected to pay a US $450 chartering fee and all members that join the chapter or at-large chapter in a high-income country will be responsible for paying a US $73.00 international induction fee; for middle- and low-income countries, please refer to the International Sliding Scale of Fees. Q: Can we keep our finances in a university bank account? A: Many honor societies find that it is beneficial to keep their finances in an institution of higher education’s bank account. Once an honor society becomes a chapter or at-large chapter, it is encouraged to investigate opening its own bank account outside the institution. Q: Can nurses who are already members of Sigma be inducted into our honor society? A: No, they cannot be inducted. They can join your honor society in addition to the Sigma chapter that they currently belong to, regardless if they are active or inactive in that chapter. Any Sigma member that wishes to become part of an honor society may simply pay the regular honor society renewal fee and join as a regular member. There is no need for these individuals to submit an application or go through the induction ceremony. If approved, they will be invited to transfer to the new chapter or to become a dual/multiple member of both or all chapters. Q: Can alumni of our nursing program who would not have qualified for membership as a student be considered as candidates for nurse leader membership? A: Yes. As long as the alumni meet the requirements stated in the bylaws for a nurse leader. You can review the nurse leader candidate criteria. As an honor society, you also have the option of considering these members within the student membership category. If they met the student criteria for membership while they were a student, even though there was not a honor society at that time, they can be inducted within that student category, if it has been less than one year since their graduation date. Q: There is a nurse in the community that does not have a baccalaureate or equivalent degree, but has done some state and nationally recognized leadership initiatives to influence health care. Is a baccalaureate or equivalent degree an absolute requirement for membership? A: Yes, nurse leader candidates are required to have a minimum of a baccalaureate or equivalent degree. The degree does not necessarily have to be a degree in nursing as long as the potential member is a registered nurse and has made achievements in the field of nursing. 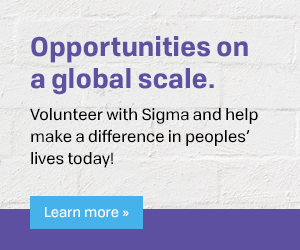 Chapters may nominate individuals who do not qualify for Sigma membership as Honorary Members of Sigma and the International Board of Directors will review their application. Read more information on honorary membership. Q: Can students be elected as members of the honor society’s board of directors? A: Students do serve on some honor societies' boards of directors. There is nothing in the bylaws that prohibits it. Having diversity on your board of directors ensures a variety of nursing perspectives are represented within the chapter and can lead to greater membership retention.